There will be twelve new emoji released later on this year depicting the experiences of people with disabilities. 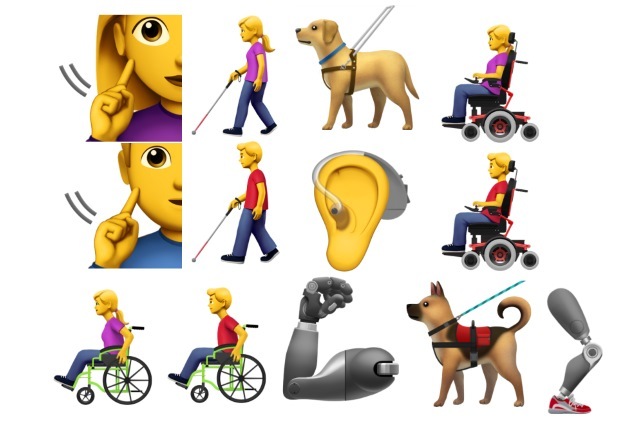 The Unicode Consortium released 59 new emoji this week; among them are several images portraying various aspects of the disability experience. The Unicode Consortium is a “nonprofit corporation devoted to developing, maintaining, and promoting software internationalization standards and data, particularly the Unicode Standard, which specifies the representation of text in all modern software products and standards.” The organization standardizes the emoji available on Apple, Google, and other devices. The new icons show people using manual and power wheelchairs, different service dogs, a hearing aid, prosthetics, and more. Apple worked with the American Council of the Blind, the Cerebral Palsy Foundation, and the National Association of the Deaf to develop the disability-specific emoji. The newest icons could be available on mobile devices as early as September of this year.